Eddie Gale won’t stop playing me his new music over the phone. I get in one question, and the 62-year-old trumpeter politely answers and immediately jumps to playing another track off his upcoming CD, Hi-Tech Beat. But the reason I’m calling Gale is to find out more about two fascinating records he released on Blue Note more than 30 years ago: Ghetto Music (1968) and Black Rhythm Happening (1969). Both discs were recently reissued by the Runt family of labels: the CD versions came out on Water Music and the 180-gram HQ vinyl editions, in snazzy gatefolds, came out via 4 Men With Beards. (Hi-Tech Beat will also come out on a Runt subsidiary, Black Beauty). 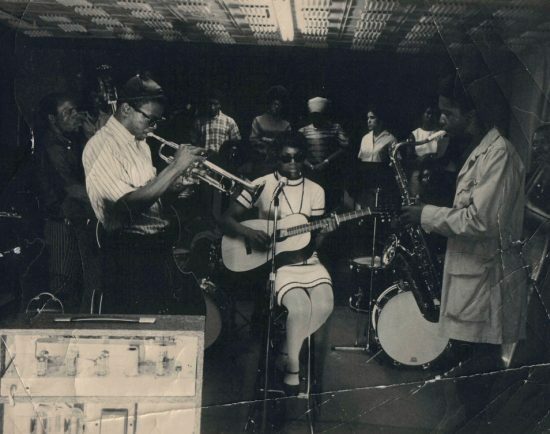 The Brooklyn-born Gale was an active participant in the New Thing scene in the ’60s, playing with Sun Ra, Cecil Taylor (Unit Structures, Blue Note) and Larry Young (Of Love and Peace, Blue Note) among many others. Those associations led him to Blue Note, whose Francis Wolff offered him a contract. Ghetto Music features two bass players-Judah Samuels and James “Tokio” Reid-and two drummers-Thomas Holman and Richard Hackett-as well as tenor saxophonist and flutist Russell Lyle. Black Rhythm Happening trades Reid for Henry Pearson and adds reedist Roland Alexander, alto saxophonist Jimmy Lyons, drummer Elvin Jones and John Robinson on African percussion. What both albums share-in addition to lots of avant soul and the trumpeter’s sister, Joann Gale Stevens, on folk guitar-are the 11 lively voices of the Noble Gale Singers, which lift the records to the level of a spiritual throwdown. His contract with Blue Note ended because United Artists bought the label. Gale left New York in 1971 to become artist in residence at Stanford University in California, and in 1972 he decided to make San Jose his new home. Gale remained busy in the Bay Area music world, but he didn’t record anything under his own name. He did hook up with Sun Ra again for tours and for records (Lanquidity and The Other Side of the Sun, both 1978; On Jupiter, 1979). In 1992 he made A Minute With Miles for Mapleshade, and he’s released a few meditative CDs on his own label, InterJazz. But Ghetto Music and Black Rhythm Happening are still Gale’s definitive statements. Sister Joann is now a journalist in Washington, D.C., and Gale thinks she would dust off the guitar and join the group again for a few concerts. I hope she busts out those fly sunglasses too.